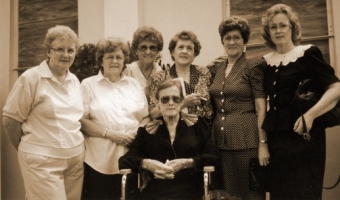 This photo was taken in the early-to-mid 1990's. 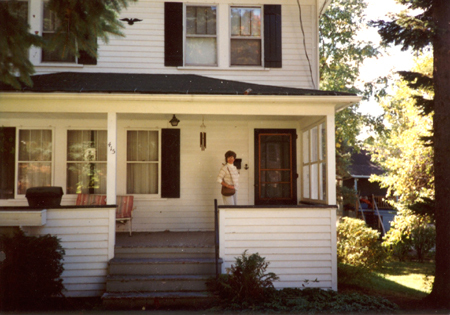 Ellen is shown here, standing on the porch. The house had undergone many renovations by this time -- new siding, and new additions, etc. A photo of the home as we knew it, with Dad's greenhouse to one side, can be seen here. Some of the Stoeckel children were born in the upper left bedroom. I remember scrambling around on Sunday mornings getting ready for Sunday School, coming home afterward and getting down on our hands and knees to read the "funnies". Of course, just about that time, company would pull up out front and there would be a mad dash to get everything picked up and put away. Heaven forbid anyone should catch us with anything out of place! I remember trying to build igloos, sleigh riding, snowball fights and coming in soaking wet, then drying out by sitting on the floor of the living room closet over the radiator. Then there was the time I came in wet, took off my "new" hand-me-down Mackinaw jacket, and spread it on the little pot-bellied stove in the cellar --- I nearly burned the house down! How about the times we jumped up from the dining room table, grabbed whatever pot or pan we could get our hands on and rushed outside to pick cherries before the starlings could strip the tree bare? Remember the watermelon someone carved "PIG" on that grew over the place Dad buried garbage? And the gray squirrel that came in to Dad's "office" and made off with the black walnuts he had stored in a keg for Mom' s Xmas baking. Poor pop! He had to eat crow when he spotted that squirrel, because he'd been accusing all of us girls on a daily basis of snitching the nuts! kitchen....the Hit Parade blaring.....Dad in the living room turning up his "Grand Old Opry" louder to drown out the Hit Parade.....it got to be a ritual, and would end up with everyone laughing! How about Lois's marvelous gift from Don when he was in the service -- a portable Victrola!!! All of us would be singing "Oh My Darlin' Clementine" to the top of our lungs, while wearing the record out! There were the backyard clambakes that we'd watch surreptitiously from the bedroom windows......the times when the party moved indoors and Hilda Muller played the piano while everyone sang. (Adults only, of course, but we enjoyed it while we sat hidden on the upper staircase listening in!) Someone would giggle, and Uncle Orrin would go to the foot of the stairs and ROAR.....YOU GIRLS GET TO BED! More giggles and a bunch of scrambling feet! 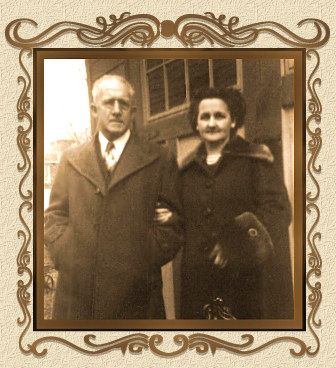 I remember our family sing-a-longs -- "Santa Lucia", "Funiculi, Funicula" -- and Jeane's yodeling which, in my eyes, made her a real, honest to goodness STAR! Then there are the quiet memories...coming upon Mom sitting at the piano, playing and softly singing "Let the Rest Of the World Go By." and "Little Brown Church in the Vale".......and Doris swinging me to sleep every afternoon when she got home from school. Yes, Doris, I remember learning to embroider, and having to pick out all the stitches that were too long or sloppy and start all over again. I figured I'd be 80 before I ever was successful at making a French Knot! Doris, you were the smart one, picking up mom's knitting and crocheting talents. My favorite day of the week was Saturday. We all had to do our respective chores before we could listen to the radio or go out and play. For me, the favorite Sat. radio program was "Let's Pretend." Saturday afternoons also meant 11 cent matinee movies with cartoons and "The Perils of Pauline", which left us on the edge of our seats until the next week's episode saved the day -- only to end with Pauline in another hair-raising predicament! After the movies, it was off to Russell's Ice Cream Parlor for huge double dip cones which cost a nickel. Yum! Does anyone remember Teaberry Ice Cream and Teaberry Gum? icy cold metal stair railing in winter! That still smarts just thinking about it! Mrs. Warren had to come to my rescue with a pitcher of water. Recess at Division Street was pretty neat. The folks in the house next door had a candy counter in their kitchen, and we were allowed to buy penny candy. I loved the miniature wax figures of boys and girls that were filled with a very sweet, colored liquid. You bit the heads off, sucked out the liquid, then chewed the wax. Remember the licorice whips, licorice candy pipes and cigarettes? How about the special animal shaped lollipops we got in our Christmas stockings? Did anything ever taste as good as the wild strawberries we pilfered from the old guy's meadow while he stood on his porch and shot a gun into the air to scare us off? Was there anything prettier than the wild violets we picked in the woods and put in paper baskets to hang on the neighbor's doors for May Day? Things were tough in those days for the adults, but I think we were all very lucky to grow up in that time and in that place. bathrobes. Marilyn was about 4 1/2 at the time. She opened hers and dumped it on the floor, with a highly indignant " I DIDN'T WANT ANY OLD BEDSPREAD! " In the house where many of us were born there was a double wide built-in closet under the stairwell. It had a raised floor to accommodate the radiators that were built in underneath, and two sets of doors. As a rule, only one set was left easily opened and the other had a slide bolt on the inside. It was a favorite place to lie down in and keep warm in the winter. One year when Uncle Lyle stayed with us during the week there was a very bad winter storm with lots of wind etc. Our Dad would sit in the living room in a chair at night and fall asleep sawing logs. Uncle Lyle often would lay down in the closet with one set of doors open and nap where it was warm. It was a favorite trick of his , before taking his nightly nap, to wait until Dad was deep asleep and then blow smoke from his pipe in Dad's face and watch him fight his way up and out of the chair. We kids thought it would be neat to play a trick on Uncle Lyle, so after he fell asleep in the closet we tied him all up -- hands, legs, feet etc. Not long after that a storm caused the ventilation glass frame on the roof of our little greenhouse across the drive from the house to blow off, and you could hear the glass shattering all over the place. Poor Uncle Lyle was scared out of his wits, and nearly killed himself trying to get out of the closet! I think he thought the roof had come off the house. He, by the way, had been out of work and unable to find a job so our Dad brought him over as a plumber's helper and each weekend would let him drive the truck home with a supply of food for their family. On occasion our mother's side of the family would hold a family reunion out in the country where they had come from -- Lake Ariel County, I think it was called. Dad had a vintage Universal long bed truck for work, as we could not afford a car. 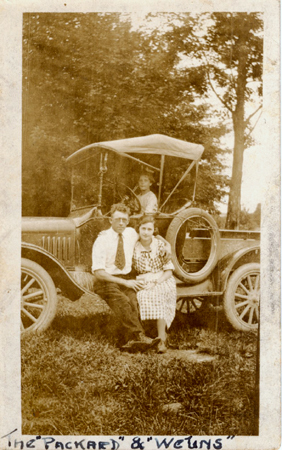 He would put three seats out of old cars in the back near the cab and we kids would ride back there. It was fun going out in the daylight, but I was scared to death of the ride back in the dark. I remember our cousin Dale was considered to be something of the family "star" and would recite poems etc. at these gatherings. Our mother would teach us all some little ditty and we would all stand up on a picnic table and sing -- I guess there was a contest of some kind but I was too little to remember the details. I remember the Baptist church where we went to Sunday school had tall, ladder back chairs. One by one, I think each of us as we got to a certain age climbed on those chairs facing the back and hanging on to the top and -- you guessed it -- the chair would spill over and we would knock our bottom teeth through the flesh at the base of our bottom lip. Our telephone number at home those days was six-nine!! We had a phone office in town with one operator, "Miss Maud", who wore powder, paint and perfume and was the talk of the town. I am sure Miss Maud knew everyone's' business working that job. The phone station would close at night, so if you had an emergency you had to find Miss Maud at home to open up shop for to be able to make a call. Each fall when the dahlias were in their glory it was not uncommon to have many cars of people drive by the house to view the garden on weekends. People came up from Scranton and Dunmore etc. to see the show. Dad was growing dahlias to "supplement our income", but I remember when people would come to buy on rare occasions, Mom would complain afterwards that they bought 2 tubers -- but he gave them another 6 free ones. He did find joy in giving things away. He had an eye for the unusual, and at times I can remember him having banty roosters, pheasants and toy bull dogs that he raised. At one time, at least some of his pheasants ended up stuffed and in the Nay Aug Park museum in Scranton. The pairs of critters I can remember were all named Maggie and Jiggs. The male bulldog was afraid of lightening, and he would jump the tall fence in the chicken run and race to the house. I was more afraid of dogs than he was of lightning, and I would scream my head off and climb up on the kitchen cupboards. This did not go over too well with Mom and Dad as I recall. I can remember some years when the tent caterpillars would be so thick they would totally cover the trunks of the trees from the ground to 5-6 feet in the air, They would suspend themselves on web lines from the branches, and there was almost no place you could walk without having to battle with that. The boys took great delight in plucking them and putting them on the girls on the way to and from school. A neighbor ended up paying us something like 5 cents a hundred for all the cocoons we could drop in a bucket, with hopes of keeping the next years population down. The men in the area would make torches out of rags and gasoline on sticks and burn out the tents the worms made on or near their property. Mom had a friend who somehow got hold of a box full of stage quality costumes in small children's sizes. We were among the poor kids in town, but we sure out-did everyone else for the one to two years we were able to fit in them! I can remember Little Lord Fauntleroy and a Santa Claus among them. Dressing up for the holidays lost some of its charm after I outgrew those wonderful things! As a young woman, I was a contestant in the "Miss Little River" Beauty Constest in Miami -- and took Third Place!